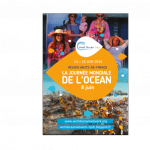 Mardi 7 juin – 20h – Conférence sur les canyons sous-marins de Méditerranée animée par le conseiller scientifique Pierre Watremez (Agence des aires marines protégées). À l’issue de leur visite, les visiteurs repartiront avec leur Passeport de Citoyen de l’Océan. This year, it’s your turn to be Ocean Explorers! All aboard for an excitement-filled tour of the world’s oceans! Your adventure begins with the treasures of the Mediterranean. Then, head for the beaches of the Cape to see the penguins, the unfathomable depths of the North Pacific, the underwater canyon of rays and sharks, the many-coloured Polynesian lagoon, the lush vegetation of the Amazon rainforest… This incredible marine tour, lasting more than two hours, culminates at Station Odyssée, with an unforgettable experience: an encounter with a giant octopus! Children’s games, immersive displays, daily activities, a sea-storm simulator and tactile pool… An experience packed with surprises that will reveal over 400 species in a way you’ve never imagined them before! Your marine exploration culminates in an encounter with a species that is both fascinating and intriguing: the giant octopus! At the heart of Station Odyssée, you may think your mind is playing tricks as you plunge into the world of this mythical animal and discover its many facets. Did you know, for example, that it has an amazing ability to blend into its surroundings? Or that each of its eight tentacles has its own autonomous “brain”? And that is just a small taste of the surprises that are in store! AN ACTIVITIES PROGRAMME PACKED WITH SURPRISES! Watch the feeding of the sharks and tropical fish, the attendants dive, the training of the penguins… Don’t miss these unique opportunities in the company of our attendants and welcome staff to get to know the marine habitat and its inhabitants better!